The vedic scriptures, found today primarily in India, are a group of related sanskrit literatures which deal fully with all aspects of knowledge, both material and spiritual, and which, according to the vedas themselves, are revealed knowledge coming directly from the Supreme Being. They were compiled in written form about 5,000 years back for the benefit of inquisitive people in this disturbed age of shortened memory, known as Kaliyuga. They were previously handed down by word of mouth, and according to internal references within the texts themselves, they date back much further than this, even to the very origin of the universe. It is true that there are other scriptures and spiritual texts found in different parts of the world may also be valid, but the qualities which set the vedas apart from all other scriptures are their wonderful breadth and depth of knowledge and their logical philosophical construction. Due to these unique qualities they are satisfying and enlightening not only to the faithful reader but also to the philosophically inclined and the aspiring transcendentalists; and, fortunately, they are still available in the original sanskrit texts, to be studied as they are or directly translated from the original form. It was Vyasadeva, the sage, who was the original compiler of all vedic literature. 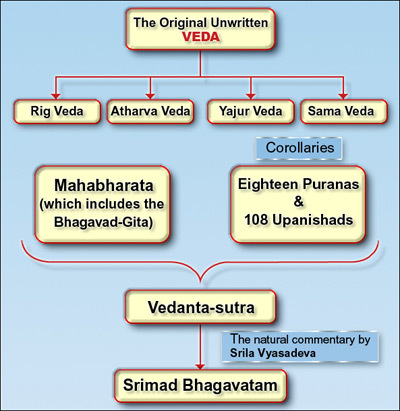 Earlier there had been only one veda, the Atharva Veda. But to make it more clear and understandable, Vyasadeva divided the one veda into four and entrusted four of his disciples to take charge of the four vedas. He then expanded upon the vedic teachings in eighteen Puranas, and he compiled an outline of the philosophical conclusions of the vedas in the Vedanta-sutra, a collection of extremely compressed, aphoristic utterances; later thinkers would present their understandings of vedic thought in the form of commentaries on these satras. The Rig Veda, the Yajur Veda, the Sama Veda, the Atharva Veda, and histories such as the Mahabharata and the Puranas are all breathed out by the Absolute Truth. Just as one's breath comes easily, these arise from the Supreme Brahman without any effort on His part." The great thirteenth-century Vaisnava teacher Madhvacarya affirms that much of the traditional literature of India can be considered part of the Veda. In his Vedanta-sutra (2.1.6) commentary, he writes: "The Rg Veda, the Yajur Veda, the Sama Veda, the Atharva Veda, the Mahabharata, the Pancaratra, and the original Ramayana are all considered Vedic literature.... The Vaisnava supplements -- the Puranas -- are also Vedic literature." The writings coming after the Upanishads and the four Vedas are known as smrti ("that which is remembered," as opposed to the vedic sruti). They include the Itihasas (epics) and the Puranas (histories). The Itihasas are the Mahabharata (110,000 verses) and the Ramayana (50,000+). There are eighteen main Puranas (including the srimad-bhagavatam), many Upapuranas (lesser puranas), and numerous regional Puranas, some more authoritative than others. Also included within the vedic literature are the Sutras (books of concise philosophical statements), the Vedangas (auxiliary sciences connected with vedic study), and the Upavedas (sciences not directly related to vedic study). The Sutras include the Srauta-sutra, the Grha-sutra, the Kalpa-sutra, the Dharma-sutra, the Sulva-sutra, and most important, the Vedanta-sutra. The six Vedangas are Siksa (phonetics), Chandas (meter), Vyakarana (grammar), Nirukta (etymology), Jyotisa (astronomy), and Kalpa (ritual). Among the Upavedas are Ayur-veda (holistic medicine), Gandharva-veda (music and dance), Dhanur-veda (warfare), and Sthapatya-veda (architecture). Tradition holds that any literature in pursuance of the vedic version is just as important as the vedas themselves. These include such books as Hari-bhakti-sudhodaya, Hari-vamsa, Brahma-yamala, and hundreds of others. Finally we can add many writings of self-realized acaryas (teachers in disciplic succession), such as Krishnadasa Kaviraja Gosvami's Sri Caitanya-caritamrta and many books of the six Gosvamis, Lord Caitanya's chief disciples.